PMTS.org • View topic - Any Weekday New England PMTS Skiers? Any weekday New England PMTS skiers? I'm looking for people to ski with on Mondays, Tuesdays or Wednesdays. I regularly ski Okemo and Bromley in VT, Mt. Sunapee in NH and Berkshire East in MA. I have a video camera and would be glad to take video. Re: Any Weekday New England PMTS Skiers? Wish I could get away more weekdays, but work is busy. We ski Berkshire East often. It's our go-to day trip, since it has one of the best, least crowded and safest slopes for practicing drills in New England. We'll probably be there tomorrow. I wish I had seen your thread earlier this past season. I live in CT and ski weekdays at Ski Butternut. I probably do the same thing next season. I want to compare notes with PMTS skiers who ski in Berkshire area. Bun-chan, sadly, Butternut is almost 2 hours away for me. Hope you have some luck finding a posse there. dtrick924 wrote: Bun-chan, sadly, Butternut is almost 2 hours away for me. Hope you have some luck finding a posse there. dtrick924, too bad. In any case, enjoy the next season. I hope we'll get a lot of snow. Thanks for your response. Hi, Bun-chan, I ski Catamount which is close to Butternut. It would be a pleasure to meet and ski with another PMTS skier , either at Catamount or Butternut. Lester wrote: Hi, Bun-chan, I ski Catamount which is close to Butternut. It would be a pleasure to meet and ski with another PMTS skier , either at Catamount or Butternut. Great! Let me send you my contact info privately. I guess there is a private messaging function somewhere here, but have to figure out how to do it. BTW, a week ago, I had a serious Rollerblade accident and dislocated/fractured my right shoulder. I was told 6 months, so should be ready for the ski season, if everything goes well. Catamount is not too far from me; it's about 2:15 drive but I've never been. If it's worth the drive it would be great to meet up and compare notes / take video. Bun-chan wrote: BTW, a week ago, I had a serious Rollerblade accident and dislocated/fractured my right shoulder. I was told 6 months, so should be ready for the ski season, if everything goes well. Hi Bun-chan, I hope you get well soon and will be ready for next ski season. l2ski wrote: Catamount is not too far from me; it's about 2:15 drive but I've never been. Hi l2ski, I ski Catamount for last few years after skiing Hunter, Windham and some other resorts. If you can ski on weekdays as me it is a great place to ski, just few people there and they take good care of the trails. Hope to meet you there next season. 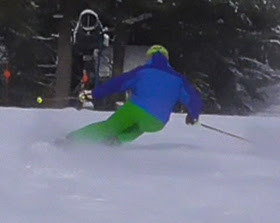 Lester wrote: Hi l2ski, I ski Catamount for last few years after skiing Hunter, Windham and some other resorts. If you can ski on weekdays as me it is a great place to ski, just few people there and they take good care of the trails. Hope to meet you there next season. I am also able to ski on a weekday mornings often enough throughout the season. I'll PM you next season. Lester, thank you for your kind word. Yesterday, my doc and I agreed and decided not to do operation, so I hope my recovery will be shorter. BTW, I never skied at Catamount, but it's not that far away from Butternut. For me, maybe a little more driving, but I definitely want to get together next season. It's good to know that there are PMTS enthusiasts in our area! I2ski, I hope you can join too. I ski at Butternut mostly during weekdays. If anyone who is interested in comparing notes, shooting photos/videos each other, discuss, etc., please let me know! I ski some selected weekdays at Wachusett or places on the Ikon pass. I was at Stratton this past Tuesday and saw someone at the ski racks with HSS straps and Head iSLs, turned out he had just been to a camp. I'd love to get video [or shoot for someone] and make some turns with PMTS folks. skifastDDS wrote: I ski some selected weekdays at Wachusett or places on the Ikon pass. I was at Stratton this past Tuesday and saw someone at the ski racks with HSS straps and Head iSLs, turned out he had just been to a camp. I'd love to get video [or shoot for someone] and make some turns with PMTS folks. I'll be at Wachusett the week of Feb 2nd.